Objective: The aim of this study is to determine the activity of an Indonesian herbal formulation, which is specific for respiratory disorders and contains a combination of Curcuma xanthorrhiza rhizome, Vitex trifolia leaves, Zingiber officinale rhizome, Citrus fruit, and Echinacea purpurea herb, as an immunomodulator in mice. Materials and Methods: Thirty male Balb/c mice were divided into five groups as follows: negative control, E. purpurea for reference, and three doses of herbal formula. The samples were administered daily for 14 days, and immune response was induced by hepatitis B vaccine on days 7 and 14. On day 18, blood was collected via the retro-orbital plexus. Macrophage phagocytosis and lymphocyte proliferation assay and measurement of immunoglobulin G (IgG) antibody titers were carried out on day 20. Results: The herbal formula can significantly increase the phagocytic index compared with the negative control. Interestingly, the herbal formula showed higher activity compared with E. purpurea-only treatment. This indicates the possible synergistic effects of the herbal components in the formula. This synergistic pattern was also observed in the production of IgG antibody. The herbal formula can significantly increase IgG titer compared with the negative control group (P < 0.05). However, the increase was nonsignificant compared with E. purpurea-only treatment. On the other hand, the herbal formula showed less effect on the induction of lymphocyte proliferation compared with E. purpurea-only treatment. Low-dose treatments showed suppressive effects. Conclusions: The herbal formula showed more immunostimulatory activity on nonspecific responses than specific immune ones. Other herbal components may contribute to the overall immunomodulatory effect of the studied herbal formula. Abbreviations used: BW: Body weight; CMC: Cell-mediated cytotoxicity; CMC-Na: Carboxymethyl chitosan in Na-salt form; ELISA: Enzyme-linked immunosorbent; HBsAg: Hepatitis B surface antigen; IgG: Immunoglobulin G; OD: Optical density; PBS: Phosphate-buffered saline; RPMI: Roswell park memorial institute; PI: Phagocytic index; MTT: 3-(4,5-dimethylthiazol-2-yl)-2,5-diphenyltetrazolium bromide. The study was conducted to determine the activity of an Indonesian herbal formulation, which is specific for respiratory disorders and contains a combination of Curcuma xanthorrhiza rhizome, Vitex trifolia leaves, Zingiber officinale rhizome, Citrus fruit, and Echinacea purpurea herb, as an immunomodulator in mice. The study employed 30 male Balb/c mice, which were divided into five groups: negative control, E. purpurea for reference, and three doses of herbal formula. The herbals were administered daily for 14 days, and immune response was induced by hepatitis B vaccine on days 7 and 14. On day 18, blood was collected via the retro-orbital plexus. Macrophage phagocytosis, lymphocyte proliferation assay, and measurement of Immunoglobulin G (IgG) antibody titers were carried out on day 20. Results show that the herbal formula significantly increased the phagocytic index compared with that of negative control. Interestingly, the herbal formula showed higher activity compared with E. purpurea-only treatment. This indicates the possible synergistic effects of the herbal components in the formula. This synergistic pattern was also observed in the production of IgG antibody. The herbal formula can significantly increase IgG titer compared with the negative control group (P < 0.05). However, the increase was non-significant compared with E. purpurea-only treatment. On the other hand, the herbal formula showed less effect on the induction of lymphocyte proliferation compared with E. purpurea-only treatment. Low-dose treatments showed suppressive effects. The herbal formula showed more immunostimulatory activity on non-specific responses than specific immune ones. Other herbal components may contribute to the overall immunomodulatory effect of the studied herbal formula. Herbal medicines have long been used in many countries, including in Indonesia, to cure diseases or promote health. Several herbal components are commonly combined to achieve synergistic or complementary effects. We developed an herbal medicine formula which is indicated to relieve the symptoms of acute respiratory disorders, such as common cold or other upper respiratory infections. The herbal formula contains extract of Curcuma xanthorrhiza rhizome, Vitex trifolia leaves, Zingiber officinale rhizome, Citrus spp., and E. purpurea herb. Our previous study suggested that the combination of V. trifolia leaves and C. xanthorrhiza rhizome extract exerts tracheospasmolytic effects and anti-allergy activity., In the development of the herbal product, we added other three kinds of herbal, i.e., Citrus spp., Z. officinale Rosc., and E. purpurea. These plants were selected based on the effect of the individual plant as an antitussive, expectorant, and an immune stimulant, which when used together, are expected to produce synergistic beneficial effects in relieving the symptoms of respiratory disorders. Citrus fruits are known to be rich in flavonoids, which are reported to feature various pharmacological activities, such as antioxidant, anti-allergic, anti-inflammatory, and anticancer properties. Citrus fruits also contain flavanone glycosides, such as hesperidin, naringin, and naringenin, in varying levels. Hesperidin was reported to feature anti-asthma activity by inhibiting the production of cytokines involved in asthma. Naringin was reported to perform an antitussive activity on guinea pig model of allergic cough caused by exposure to cigarette smoke. Z. officinale exhibits pharmacological activities in the respiratory tract, particularly as an antitussive and anti-inflammatory. Echinacea is a popular herb that is widely used as an immune system booster. This plant works by triggering the complement pathway and increase in the number of leukocytes, stimulating phagocytosis and T-cell lymphocyte production, and increasing the activity of lymphocytes and cellular respiration. The combination of the five herbals is expected to yield mutual or synergistic effects to relieve the symptoms of respiratory disorders. As most of the upper respiratory infections usually occur in immunocompromized individuals, and the severity of symptoms will be more likely reduced when the immune system is increased, the immunomodulatory activity of the herbal formula must therefore be studied. In the recent study, the potency of an herbal formula to stimulate the specific and non-specific immune system was investigated in a mouse model. The herbal medicine formula was prepared by PT. Soho Industri Pharmacy, Jakarta, Indonesia and was made in accordance with the standards of good manufacturing practice. For administration of the herbal formula to the animals, the herbal formula was prepared as a suspension in 0.5% Carboxymethyl chitosan in Na-salt form (CMC-Na), which is an inert suspending agent. The herbal was then prepared in stock suspensions with concentrations of 10, 20, and 40 mg/mL. The study was conducted in thirty 8–10-week-old Balb/c male mice weighing between 18 and 25 g. The animals were bred and maintained under standard laboratory conditions (temperature 25°C ± 2°C and light period of 12 h). A commercial pellet diet and water were given ad libitum. The protocol of study had been approved by the Ethical Committee from The Integrated Research and Research Laboratory, Universitas Gadjah Mada (UGM). The animals were grouped into five groups with 6 mice each, i.e., one for the negative control, one for the reference, and three groups for the herbal formula with different doses. The reference was E. purpurea extract equivalent to 750 mg human daily dose. E. purpurea was selected as it is well-recognized as an herbal with immunomodulatory activity. The reference herbal was prepared as a formula with a brand name and already marketed in Indonesia. Three different doses of the tested herbal formula were calculated by conversion from the estimated human dose (three tablets/day or 3744 mg/day) with a conversion factor of 0.0026 for mice. The calculated result (490 mg/kg body weight [BW]) was set as the middle dose (Dose 2). Dose 1 was at 245 mg/kg BW, and Dose 3 was set at 980 mg/kg BW. The dose of reference drug was also determined by conversion from the human daily dose. All the tested drugs were prepared as a suspension in 0.5% CMC-Na and orally administered for 14 days. To induce the immune system response, the animals were vaccinated with 1 mL hepatitis B vaccine (Engerix®, GlaxoSmithKline) (containing 20 mL Hepatitis B Surface Antigen [HBsAg]) intraperitoneally on days 7 and 14 of drug administration. On day 18, 1 mL blood was collected through a capillary via the retro-orbital plexus (orbital vein of the eye). The blood was allowed to stand for 1 h and centrifuged at 3000 rpm for 10 min. The serum was then isolated and stored at −20°C until later use. The immunomodulatory activities were assayed on day 20: macrophage phagocytic capacity, induction of lymphocyte proliferation, and measurement of Immunoglobulin G (IgG) antibody titer. Isolation of macrophages was carried by the method of Spilsbury et al. with slight modification. Macrophages were isolated from the mouse peritoneal cavity with ±10 mL of cold Roswell Park Memorial Institute (RPMI) medium. The aliquot was centrifuged at 1200 rpm 4°C for 3 min. A total of 3 mL of RPMI 1640 complete media (containing fetal bovine serum 10% (v/v)) was added to the sediment. The cells were suspended in complete medium and counted to obtain a cell suspension with a concentration of 2.5 × 106 cells/mL. A 200 μL macrophage suspension containing 105 cells/mL was then inoculated on a 24-well microplate, which was covered by round coverslips. The cells were incubated for 30 min at 37°C in CO2 5% incubator. After 24 h, each well was washed thrice using the culture medium RPMI, followed by incubation for 2 h. The cells were then washed twice with RPMI 1640. Then, 1 ml of complete medium was added, followed by incubation for 24 h. Nonspecific phagocytic activity was observed in vitro using Candida albicans. Candida albicans, which was obtained from the Laboratory of Microbiology, Faculty of Pharmacy, UGM, was cultured in phosphate-buffered saline (PBS) medium for 18 h. A total of 200 μL of C. albicans suspension in PBS with a concentration of 5 × 103 cells/well was added to the well with 100 μL RPMI medium. The plate was then incubated in the CO2 incubator at 37°C for 30 min. The coverslips were washed thrice with PBS to remove the excess particles and were then dried at room temperature. The coverslips were then fixed with absolute methanol for 30 s and dried at room temperature. Afterward, the cells were stained with 10% Giemsa stain for 20 min, washed with distilled water, and then dried. The number of macrophages actively phagocytizing C. albicans and the C. albicans phagocytosed by macrophages were counted under an inverted microscope. The mouse spleen was obtained aseptically and placed in a petri dish containing 10 mL RPMI 1640 medium (Sigma Aldrich, Germany). Then, the spleen was extruded to obtain a spleen cell suspension. The cell suspension was placed in a conical and allowed to stand for 1 h and then centrifuged at 4000 rpm at 4°C for 3 min. Pellets were suspended in 2 ml of Tris-ammonium chloride buffer and left at room temperature for 5 min. After addition of RPMI medium to prepare a 10 mL suspension, the cells were centrifuged again at 4000 rpm at 4°C for 3 min. The supernatant was discarded, and lymphocyte cells were suspended in complete RPMI medium (1 mL). The cells were counted using a hemocytometer (Neubauer) and re-suspended again with complete RPMI medium to obtain a lymphocyte cell suspension with a density 105/mL. Lymphocyte proliferation assay was carried out using 3-(4,5-dimethylthiazol-2-yl)-2,5-diphenyltetrazolium bromide (MTT) reduction method. Briefly, 100 μL of the cell suspension was added to each well in 96-well microplates then incubated in the CO2 incubator at a temperature of 37°C for 48 h. After incubation, 10 μL of MTT 10 μL of MTT (Merck, Germany) in sterile PBS (5 mg/mL) was added to each well, followed by 4 h incubation at 37°C. Viable cells will react with MTT and turn purple. A total of 100 μL of stop solution (10% sodium dodecyl sulfate solution in 0.01 N HCN) was added to each well, followed by subsequent incubation for 24 h. The optical density (OD) was determined by a Microplate Reader (Bio-rad Benchmark, Japan) at 550 nm. Measurement of IgG antibody titers was carried out using a mouse IgG enzyme-linked immunosorbent assay kit 96T from Bioassay Technology Laboratory®. All reagents, standard solutions, and serum samples were stored at room temperature during preparations. A 50 μL standard solution was added to the standard wells. Then, 40 μL of serum sample and 10 μL of anti-IgG-antibody were added into the sample wells. Streptavidin–horseradish peroxidase (50 μL) was then added to each well. The plate was covered with a sealer and incubated for 1 h at 37°C. Afterward, the sealer was removed, and the plate was washed five times with the washing buffer. The A substrate solution and B substrate solution were added to each well at 50 μL/well each. The plate was incubated for 10 min at 37°C in the dark. Then, 50 μL of stop solution was added to each well. The addition of stop solution will cause the blue-to-yellow color transformation. After 30 min, the ODs were determined using a microplate reader (Bio-Rad Benchmark Japan) at 450 nm. Using PI as the parameter, the macrophage activity was measured by the ability of macrophages to phagocytose C. albicans. [Table 1] shows the results. Statistical analyses (P < 0.05, n = 3) by non-parametric Kruskal–Wallis test, followed by Mann–Whitney test, showed significant differences between groups. The results showed the dose-dependent increased activity of macrophages at three different doses compared with the negative control group. In terms of PI, when compared with the E. purpurea extract, Dose 1 and 2 groups yielded the relatively same PI value, whereas Dose 3 showed a significantly higher PI. [Table 2] displays the effects of the tested herbal on lymphocyte proliferation. Statistical analyses (P < 0.05, n = 3) by nonparametric Kruskal–Wallis test followed by Mann–Whitney method showed significant differences between groups. As shown in [Table 2], E. purpurea showed no significant effect on lymphocyte proliferation. Dose 1 and 2 herbal formulas showed a suppressive effect on lymphocyte proliferation. Dose 3 increased lymphocyte proliferation, which is statistically significant compared with that of the negative control (P < 0.05). Measurement of the antibody titer of the samples was calculated from the equation of standard curve obtained from the OD values of five standards. The equation used in this research was y = 0.0591x + 0.9652 with R2 =0.9403; y is the OD, whereas x is the concentration (μg/ml). The concentrations obtained were analyzed statistically (P < 0.05) by non-parametric Kruskal–Wallis followed by Mann–Whitney test and showed significant differences between groups. 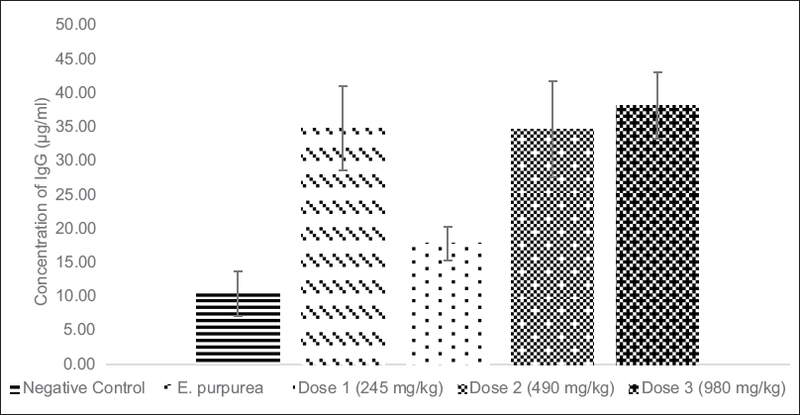 In induction of IgG production, as displayed in [Figure 1], E. purpurea activity significantly increased antibody production (P < 0.05). The herbal formula also exhibited dose-dependent activity to induce IgG production. The immune system is divided into specific and non-specific responses. Macrophages are the cornerstone of the innate immune system, which is nonspecific. Macrophages are found in all body tissues, where they await for pathogens. Stronger in vitro phagocytosis by macrophages is indicative of significant pathogen clearance and antibody levels in vivo. In respiratory diseases, infections can be caused by viruses or bacteria, with the symptoms including cough, inflammation, sore throat, runny or stuffy nose, body ache, or headache. Macrophage phagocytosis is a nonspecific defense that occurs sooner than specific defense to limit infections. In the specific immune response, lymphocyte proliferation and antibody production are often used as markers. Lymphocytes are the cells responsible for the specificity of adaptive immune responses. Lymphocytes usually respond to foreign antigens only if the innate immune system is first activated. As part of the adaptive immune response, several lymphocytes proliferate and differentiate into memory cells, which can respond faster and more efficiently the next time the same pathogen invades. Macrophage phagocytosis, lymphocyte proliferation, and IgG production can be modulated by drugs or compounds with immunomodulatory activity. A number of herbal medicines have been reported to present immunomodulatory activity. Examples include Withania somnifera, Eclipta alba and Centella asiatica, Catharanthus roseus, Capsicum spp., Taxus brevifolia and Galanthus caucasicus, Allium sativum, Andrographis paniculate, Acacia catechu, Euphorbia hirta, and Tinospora cordifolia. Our herbal formula contains five herbal medicines, C. xanthorrhiza, V. trifolia, Z. officinale, Citrus spp ., and E. purpurea. The use of the combination of these herbal medicines is expected to exert synergistic and complementary effects to relieve the symptoms of respiratory disorders. The synergism or complementary effects from the herbal formula was shown in the macrophage phagocytic activity. E. purpura has long been used conventionally for the treatment of various types of infections and wounds. This plant displays multiple immune-modulatory activities, comprising stimulation of certain immune functions, such as the phagocytic activity of macrophages and suppression of the proinflammatory responses of epithelial cells to viruses and bacteria., Dose 2 of the herbal formula contained E. purpurea equivalent to a human dose of 450 mg/day and showed a higher PI compared with the reference E. purpurea, which contained higher E. purpurea extract (equivalent to a human dose of 750 mg/day). This result indicates that the extracts present in the formulation exhibited synergistic effects on PI. This action is possibly supported by curcumin, which was reported to enhance non-inflammatory phagocytic activity in murine macrophages. The possible mechanism occurs by blocking nitric oxide synthesis, a scavenger function of macrophages in non-inflammatory condition. This enhancement of phagocytic activity is triggered directly by the signals from curcumin itself and not by apoptotic cells. The phytochemical compound from V. trifolia is another component featuring a stimulatory activity on macrophage phagocytosis. Singh et al. reported the immunostimulatory activity of compounds from Vitex negundo in oxyburst phagocytic assay using human polymorphonuclear cells. The other herbal component, i.e., Z. officinale, was also reported to enhance macrophage functions and probably contributed to the strong effect of the herbal formula on macrophage phagocytic activity. The results support the high activity of the herbal formula to enhance the non-specific immune system. However, such synergistic effect has not been observed in lymphocyte proliferation. Our results show that the herbal formula is less active in inducing lymphocyte proliferation. The highest dose, which contained E. purpurea equivalent to a human dose of 900 mg/day, was slightly more potent than the reference containing E. purpurea equivalent to a human dose of 750 mg/day. Dose 1 and 2 groups with E. purpurea equivalent to a human dose of <900 mg/day showed a lower lymphocyte proliferation than the negative control. Several herbal components in the formula exhibited a suppressive effect on lymphocyte proliferation despite the existence of E. purpurea, which is already established to feature a stimulatory effect on lymphocyte proliferation. A study by Gao et al. revealed that curcumin most likely inhibits cell proliferation, cell-mediated cytotoxicity (CMC), and cytokine production by inhibiting nuclear factor-kappa B target genes involved in the induction of these immune responses. Vitexicarpin, a phytochemical compound from Vitex rotundifolia (similar to V. trifolia), was reported to feature an inhibitory effect on mouse lymphocyte proliferation. Several phytochemical components from Z. officinale, such as (6)-gingerol, (8)-gingerol, and (10)-gingerol, were also reported to inhibit lymphocyte proliferation with slightly different potencies. These components contribute to the lesser effect of the herbal formula to stimulate the specific immune response. The effect of the tested herbal in IgG production after immunization with hepatitis vaccine showed a different pattern. The reference E. purpurea significantly increased the IgG production. The herbal formula also exhibited a significant stimulatory effect on IgG production compared with the negative control (P < 0.05) in a dose-dependent fashion. A synergistic effect possibly existed among the herbal components, as Dose 2, which contained an equivalent with 450 mg E. purpurea, showed a slightly higher IgG production with that induced by reference E. purpurea equivalent to 750 mg. Dose 3, which contained E. purpurea twice that of Dose 2, presented no significant increase in the stimulatory effect, as the IgG production slightly increased compared with that in Dose 2. Thus, it seems that there is an optimal dose on stimulating IgG production, due to the highest dose in this research fails to significantly increase the effect. As mentioned previously, the herbal formula was developed to relieve the symptoms and reduce the severity of respiratory disorders. Other pharmacological activities related to the indication have been determined separately; these activities include analgesic, anti-inflammatory, antitussive, and expectorant (unpublished) actions and showed positive results. With this immunomodulatory activity, along with other pharmacological activities, the herbal formula features a promising activity to be used as an alternative herbal remedy for treating the symptoms of respiratory diseases. The herbal formula containing the combination of C. xanthorrhiza rhizome, V. trifolia leaves, Z. officinale rhizome, Citrus fruit, and E. purpurea herb showed synergistic effects as immunomodulatory, specifically on enhancing macrophage phagocytic activity and the production of antibody IgG. On the other hand, the herbal formula is less effective in increasing lymphocyte proliferation as part of the specific immune response. Therefore, the studied herbal formula is effective as a non-specific immunomodulatory agent. Authors would like to thank Directorate General of Research and Technology and Higher Education, Republic of Indonesia for financial support through research grant No. 2526/UN1.P.III/DIT-LIT/LT/2017 and Ingrid Toha from PT. Soho Industry Pharmacy for preparing the herbal formula. This study was financially supported by Directorate General of Research and Technology and Higher Education, Republic of Indonesia (research grant No. 2526/UN1.P.III/DIT-LIT/LT/2017). The herbal formula used in this study was prepared by PT. Soho Industry Pharmacy. Ikawati Z, Wahyuono S, Maeyama K. Screening of several Indonesian medicinal plants for their inhibitory effect on histamine release from RBL-2H3 cells. J Ethnopharmacol 2001;75:249-56. Wahyuono S, Alam G, Ikawati Z, Timmerman H, Maeyama K. Antiasthmatic compounds isolated from antiasthmatic “JAMU” ingredient legundi leaves (Vitex trifolia L.). Sci Pharm 2009;77:192. Belajova E, Suhaj M. Determination of phenolic constituents in citrus juices: Method of high performance liquid chromatography. Food Chem 2004;86:339-43. Horowithz R, Gentili B. Flavonoid constituents of citrus. In: Nagy S, Shaw PE, Vedhuis MK, editors. Citrus Science and Technology. Westport (CT): AVI Publishing; 1977. p. 397-426. Kim SH, Kim BK, Lee YC. Antiasthmatic effects of hesperidin, a potential Th2 cytokine antagonist, in a mouse model of allergic asthma. Mediators Inflamm 2011;2011:485402. Jiao HY, Su WW, Li PB, Liao Y, Zhou Q, Zhu N, et al. Therapeutic effects of naringin in a guinea pig model of ovalbumin-induced cough-variant asthma. Pulm Pharmacol Ther 2015;33:59-65. Luo YL, Zhang CC, Li PB, Nie YC, Wu H, Shen JG, et al. Naringin attenuates enhanced cough, airway hyperresponsiveness and airway inflammation in a guinea pig model of chronic bronchitis induced by cigarette smoke. Int Immunopharmacol 2012;13:301-7. Rehman R, Akram M, Akhtar N, Jabeen Q, Shah SM. Zingiber officinale roscoe (pharmacological activity). J Med Plant Res 2011;5:344-8. Hudson JB. Applications of the phytomedicine Echinacea purpurea (Purple Coneflower) in infectious diseases. J Biom Biotechnol 2012;2012:769896. Spilsbury K, O'Mara MA, Wu WM, Rowe PB, Symonds G, Takayama Y. Isolation of a novel macrophage-specific gene by differential cDNA analysis. Blood 1995;85:1620-9. Tjahajati I, Projoharjono S, Soebono H, Asmara W, Harada N. Aktivitas sekresi reactive oxygen intermediate (ROI) pada makrofag peritoneum kucing yang diinfeksi dengan M. tuberculosis [Secretion activity of reactive oxygen intermediate (ROI) in peritoneal macrophages of M. tuberculosis infected cat]. J Sains Vet 2004;22:46-53. Jensch-Junior BE, Pressinotil N, Borges JC, Cunha da Silva JR. Characterization of macrophages phagocytosis of the tropical fish Prochilodus Scrofa (Steindachner, 1881). Aquac 2006;251:509-15. Kusumaningrum ADR, Sumadiono S, Soenarto Y. Effects of Phyllanthus niruri on the severity of the common cold in children. Paediatr Indones 2012;52:346-51. Parnham MJ. Immunomodulatory approaches to the treatment of infections Croatian. J Infect 2011;31:15-27. Agarwal R, Diwanay S, Patki P, Patwardhan B. Studies on immunomodulatory activity of Withania somnifera (Ashwagandha) extracts in experimental immune inflammation. J Ethnopharmacol 1999;67:27-35. Aderem A. Phagocytosis and the inflammatory response. J Infect Dis 2003;187 Suppl 2:S340-5. Sun SF, Pan QZ, Hui X, Zhang BL, Wu HM, Li H, et al. Stronger in vitro phagocytosis by monocytes-macrophages is indicative of greater pathogen clearance and antibody levels in vivo. Poult Sci 2008;87:1725-33. Alberts B, Johnson A, Lewis J, Raff M, Roberts K, Walter P. Molecular Biology of the Cell. 4th ed. New York, NY: Garland Science; 2002. Jayathirtha MG, Mishra SH. Preliminary immunomodulatory activities of methanol extracts of Eclipta alba and Centella asiatica. Phytomedicine 2004;11:361-5. Jantan I, Ahmad W, Bukhari SN. 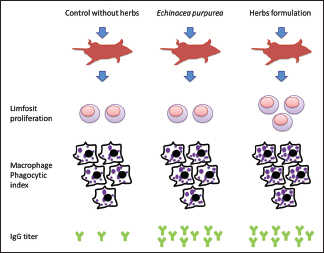 Plant-derived immunomodulators: An insight on their preclinical evaluation and clinical trials. Front Plant Sci 2015;6:655. Akram M, Hamid A, Khalil A, Ghaffar A, Tayyaba N, Saeed A, et al. Review on medicinal uses, pharmacological, phytochemistry and immunomodulatory activity of plants. Int J Immunopathol Pharmacol 2014;27:313-9. Block KI, Mead MN. Immune system effects of Echinacea, Ginseng, and Astragalus: Areview. Integr Cancer Ther 2003;2:247-67. Bisht K, Choi WH, Park SY, Chung MK, Koh WS. Curcumin enhances non-inflammatory phagocytic activity of RAW264.7 cells. Biochem Biophys Res Commun 2009;379:632-6. Singh DD, Chitra G, Singh IP, Bhutani KK. Immunostimulatory compounds from Vitex negundo. Indian J Chem Technol 2005;44:1288-90. Koh EM, Kim HJ, Kim S, Choi WH, Choi YH, Ryu SY, et al. Modulation of macrophage functions by compounds isolated from Zingiber officinale. Planta Med 2009;75:148-51. Cundell DR, Matrone MA, Ratajczak P, Pierce JD Jr. The effect of aerial parts of Echinacea on the circulating white cell levels and selected immune functions of the aging male Sprague-Dawley rat. Int Immunopharmacol 2003;3:1041-8. Gao X, Kuo J, Jiang H, Deeb D, Liu Y, Divine G, et al. Immunomodulatory activity of curcumin: Suppression of lymphocyte proliferation, development of cell-mediated cytotoxicity, and cytokine production in vitro. Biochem Pharmacol 2004;68:51-61. You KM, Son KH, Chang HW, Kang SS, Kim HP. Vitexicarpin, a flavonoid from the fruits of Vitex rotundifolia, inhibits mouse lymphocyte proliferation and growth of cell lines in vitro. Planta Med 1998;64:546-50. Bernard M, Furlong SJ, Power Coombs MR, Hoskin DW. Differential inhibition of T lymphocyte proliferation and cytokine synthesis by -gingerol, -gingerol, and -gingerol. Phytother Res 2015;29:1707-13.